Why A Jazz Festival Is Asking Musicians To 'Do It Yourself' : A Blog Supreme The Undead Music Festival hosts a nationwide "Night of the Living DIY" this Friday, organizing house concerts from Oakland to Brooklyn. As one grassroots concert presenter explains, living rooms might just be where improvisation thrives best. 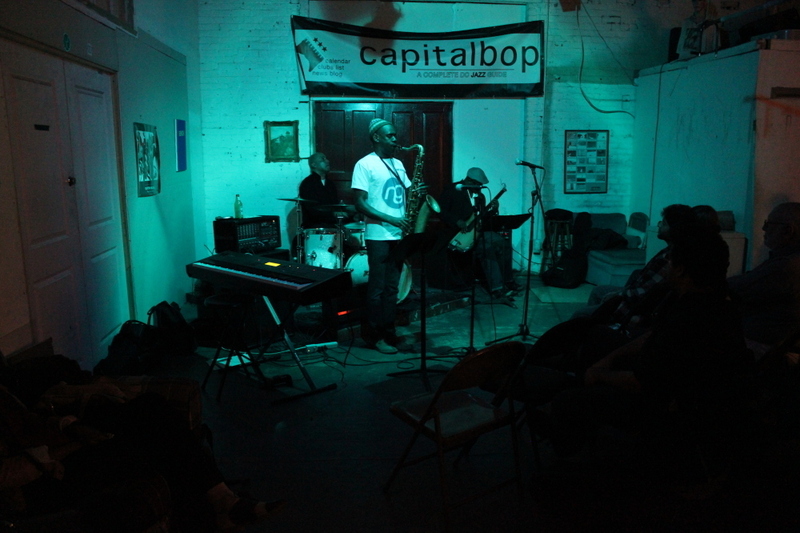 Mad Curious, with drummer Lenny Robinson, saxophonist Brian Settles and bassist Tarus Mateen, performs at a Capitalbop house show. The Undead Music Festival, which lifted off last night, has grown every year. On Friday, it will outgrow New York City. Now in its third year, this jazz festival typically seizes small pockets of Brooklyn and Lower Manhattan, as it did yesterday, building immersive urban playgrounds where largely young audiences flood venues with colored admissions bracelets. It is jazz as both heady experience and social happening. But on Friday's Night of the Living DIY, the venues scatter across five Brooklyn neighborhoods, as well as a half-dozen cities across the U.S. Still, the festival's expansion — and its use of "do-it-yourself" spaces rather than traditional clubs — is really a way of asking audiences to think smaller, to look closer to home. To turn off (computers and stereos), tune out (from your MP3 collection) and drop in (on a snug, local gathering). As the head of Capitalbop, an organization that seeks to engage local jazz audiences in Washington, D.C., and presents informal shows in service of that goal, I find this development exciting. Search & Restore, one of the groups responsible for Undead, has decided to feature living-room venues simply because they are already thriving: A quiet movement of artist-produced, anti-corporate jazz concerts is creeping across the country. Here are a few of the motivations that I've perceived for this idea, and for Undead's decision to embrace it. 1. Jazz thrives in unmediated spaces. The venues at the Night of the Living DIY range from artist studios to musicians' lofts. Some don't have event permits, let alone liquor licenses. One, in Bedford-Stuyvesant, is the living room of Search & Restore director Adam Schatz's friends. In these settings, "You're just in a room with the music, and that's what's important," Schatz told me earlier this week. "On the artistic side, that's usually where it starts — people playing this music in their homes — and it's kind of cool to perform it in a similar, raw setting. Not just physically raw, but emotionally raw: There's a kind of vulnerability to [these spaces] that I think really magnifies the humanity of the music, which is what makes it so special." In my experience, Schatz is exactly right. With a crowd of curious listeners bunched up in a small room, nothing but a share of the floor or a spongy couch to sit on, the musical experience is remarkably direct. It's no coincidence that historically, jazz's most generous gardens of innovation have included low-lit New Orleans brothels, Harlem brownstones and Soho lofts. 2. A technology-drowned society demands raw experiences. The critic Whitney Balliett famously described jazz as "the sound of surprise." As I see it, this is the music's strongest claim to importance today. Many of us now attach ourselves to machines, and they're increasingly engineered to deny us surprises. The Google ads that accompany our browsing form a closed circuit, tailored to the terms we've searched or the subject line we've sent. The IT age has brought us mammoth businesses with a firmer grip on our everyday actions than ever before, and a more insidious ability to invent their own necessity. Last month, in a New York Times op-ed, psychologist Sherry Turkle weighed in: "We've become accustomed to a new way of being 'alone together.'" (The jazz allusion seems incidental.) "[W]e are together, but each of us is in our own bubble, furiously connected to keyboards and tiny touch screens." The focus at the Night of the Living DIY combats all that by building community, one makeshift room at a time. Close-knit gatherings, where women and men are urgently making music just feet away from their listeners, are an excellent way to encourage triumphant compassion. Schatz is conscientious about the importance of such lifelines to humanity. "For the large part, social media makes me sick to my stomach," Schatz said. "The question for me is, 'How can I connect people with things that are so explosively real and present that they can sort of combat the idea that everything you need in life is on the Internet?' [Jazz] is something that happens differently every single time." Lucas Gillan is a drummer who co-runs a concert series called House Party Starting in Chicago. For the Night of the Living DIY, he's helping to present a show in a gallery. "I feel like it is very appropriate" to showcase jazz in homes, he said. "It's a conversational music. You go to a party to talk to people you've never met before and to have a conversation, and hopefully you can learn something new about somebody. And you go to a party to hear some music that's going to be in the moment and part of the atmosphere." 3. Doing it yourself is easier than ever before. For all that the Internet has done to lure us out of the crowd and into a cloud, it has also fostered an equal and opposite force: democratizing the tools of making and doing. Individuals now have remarkable means for entrepreneurship. No matter the realm — presenting live music, assembling a recreational sports league, community organizing — it's relatively simple to build something that guides people to each other. Inviting all your friends to a house concert, and encouraging them to invite all of their own friends, is as simple as creating a Facebook event. Search & Restore, which started in 2007 as a small concert-presenting outfit, blossomed online. Schatz launched a website in 2009 as a hub for promoting the organization's shows, plus other mutinous elements of the New York City jazz scene. The following year, a crowd fundraising campaign on Kickstarter earned him more than $76,000 and a profile in The New York Times' Sunday edition. Schatz used the money to launch a video documentation initiative, and today Search & Restore's website features about 100 videos of live jazz performances around New York. The means of growth might have been digital, but the ends remain planted in the real world. "I'm always conscious and concerned about the thousands of people who have never gotten the chance to experience this music," Schatz said, defaulting to talking about its live expression. "For now, doing it through the videos is an important first step." Jamie Breiwick is a trumpeter and the co-founder of Milwaukee Jazz Vision, an advocacy organization that will present a Night of the Living DIY show at a multipurpose arts space. His group's website is robust, offering a calendar of Milwaukee jazz events, a guide to the scene's hotspots and a multimedia archive. However, "the ultimate goal in our case is to get people to come out and see shows live — get people out of the digital world and into the real world," Breiwick said. "Using Facebook and Twitter and all that stuff is just another method by which to let people know what's really happening." 4. The punk ideal of DIY resonates among alternative-minded youth. When Schatz named the festival Undead, the idea was to resist the idea that jazz is "dead" or "dying," while evoking some accepted tokens of outré youth culture: namely, zombies. The term DIY, as it applies to music, dates back to punk rock's origins in the late 1970s, when bands resisting or rejected by commercial venues and record labels struck out on their own. They held their own concerts, self-released records and published stapled-together fanzines. Undead appeals to a similar type of audience: young, educated, imbued with (perhaps more vague) anti-establishment notions of hipness, searching for genuine experiences. This isn't without its perils. To me, Undead and its sister jazz festival Winter Jazzfest fail to attract enough young people who aren't middle-class, white males. Aligning with an underground method of presentation potentially brings us further from inclusivity: Who is being invited to the performances, and who feels welcome? 5. From musicians' perspective, DIY pays. Schatz thinks traditional jazz clubs, with drink minimums and hounding wait staffs, have done as much to harm jazz's popularity as have those clubs' own scarcity. (It's why Search & Restore typically favors standing rock clubs and other alternative venues.) But as a saxophonist, Schatz also sees clear advantages for musicians to playing at house parties and artist-run spaces. "Aside from the fact that it's hard to get a club to even check out your music, it's much more likely you'll have a crowd [at a DIY show]," Schatz said. "It's much more likely you'll have people there who actually care. And it's a good way to meet people." Some of the shows at Friday's nationwide Night of the Living DIY are being organized by people whom Schatz met while crisscrossing the country with his band. "Adam actually played in my living room last May," Gillan said. Giovanni Russonello is a regular contributor to JazzTimes and the founder of Capitalbop.